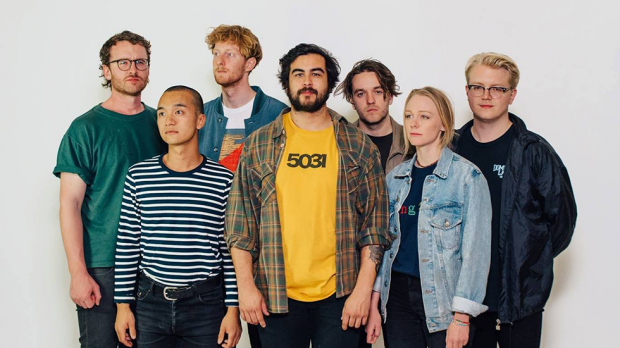 Adelaide seven-piece West Thebarton have elevated themselves into the spotlight of Australian indie rock in 2018 with an impressive run of new music and energetic live shows across the country. Since 2016, the band has been forging themselves into our consciousness with their self titled EP, support slots with the likes of Bad//Dreems, Cloud Nothings and King Gizz, plus appearances at BIGSOUND and Groovin’ The Moo. Now with the release of their long-awaited debut LP in May 18, Different Beings Being Different has West Thebarton bringing their gritty, soul-filled rock’n’roll party to WA with shows at Badlands Bar on Friday, June 22 and Mojos Bar on Saturday, June 23. ANNIE MUNROE chatted to guitarist and percussionist Brian Bolado to find out how a collective of “music nerds” managed to channel their diverse personalities and musical abilities into an acclaimed record and world-ready live show. Congratulations on the success of your debut album, Different Beings Being Different. Where did this all begin? Can you tell us how you guys came about? We started off meeting each other at local pubs and shows because we all just shared a love for the local Adelaide scene. We started talking a little bit more about what we were doing, what we were playing and what we thought about other bands. It seemed like a perfect fit once we hung out and played a few songs together. Adelaide’s a bit of a smaller community compared to the east coast and it’s nice to have a creative network of friends you can draw on. It’s just one of those things where everyone was just keen to join the band because it was such a spectacle to see us play and everyone wanted to be part of it. You’ve had some awesome opportunities recently, including your appearance on Rage which must have been pretty surreal. How do you and the band react to big moments like that? For different members of the band there’s been different moments. I guess like you mentioned, Rage was a big eye-opening one – you spend so many Saturdays growing up while you’re getting ready for sport or doing something with your family and Rage comes on. You just know that red couch and that neon light like the back of your hand. In recent memory, that’s definitely one of those life-goals that we’ve ticked off. Everyone in the band is a huge music nerd. As well as that, we’ve been filling out all these shows for this tour and the rooms have been packed! Crowds have been singing the words back to us and looking after each other in the pit. We’ve been really proud of this album we’ve put out. And you’re set to play at Reading in August over in the UK? That must be huge for you! Yeah, that’s right. We’re playing a few shows in the European summer and playing a string of US festivals, which is huge. It’s taking up a big part of our brains at the moment right now. We’ve got big things to look forward to in the next couple of months. We’re definitely taking it one step at a time at this stage. So you’re in the midst of touring, you’ve sold out some big venues and you’re set for two shows this weekend in WA. How do you think Perth will compare to some of the other states? We’ve heard really great things about the Perth music scene. We’re all fans of some of the bands that are over there like Tired lion, Verge Collection and Spacey Jane who are playing with us this weekend. The only time that we’ve played there was with Polish Club at Rosemount Hotel and that was a really great show. For me, I’ve got a bit of a soft spot for the city. My parents lived there for a few years and I’ve been there a handful of times on my own to visit the parents and it’s been awesome. With so many big personalities, I would imagine logistics would be a nightmare for you. How did you find writing this album with so many sources of creative input? Most of our writing process takes place in two different forms. We introduce an idea or two and we will write from that but for the most part songs will usually either be brought in by one person and everyone will chip in a little bit. I’d say that 20% of this album was probably created when we were just jamming and bouncing off each other on the fly. Seven members can seem like a bit of a nightmare but we’ve been playing with each other for so long that we kind of recognise where to give and take or whose point it is within the song to shine for this part and this piece. It’s really good having seven members because by the time you get to the point of playing it live it’s gone through such a vetting process. We’re just people who are big music fans that want to do the best we can. Did you guys set out with a message or a theme that you wanted to come across in this album? Lyrically, I know that Ray’s big thing for his lyrics is building stories that people have told him or that he’s experienced himself. By capturing different stories, he kind of embraces the fact that not everyone is the same. We all have different ideas, musically and just as people. At the end of the day, it’s the glue that keeps us together. My own influences are pretty wide and far reaching. Musically, I guess one of the things that we all decided that we wanted was to write something that was timeless in a sense. We didn’t want to adhere to a particular sound or genre or a decade. It was just about taking all the parts of what we could bring to the band and carrying that identity. There’s just so much happening in the rock scene in Australia at the moment. I feel really proud having all these bands make it big and tour internationally through that genre and represent us. How do you guys feel being a part of that movement? It’s really exciting. We’ve turned our eyes towards all these bands that are moving up in the ranks and jumping onto tours and getting into the same venues with all these bands that we look up to. It’s really humbling you know, we’re from Adelaide and it’s sort of a statement of what happens when you work hard to play these shows and get interstate. Your fans are already hungry for more. Do you think over the course of your tour you guys will be writing and putting out new music? Yeah, well we’re always writing and coming up with ideas. Even last night we had a bit of a show and tell about what we’ve got coming. The second album will come, whether it happens this year or next remains to be seen. At this stage, we’re definitely going to be playing the whole album in Perth and Freo. We owe it to our fans on the west coast to do that.